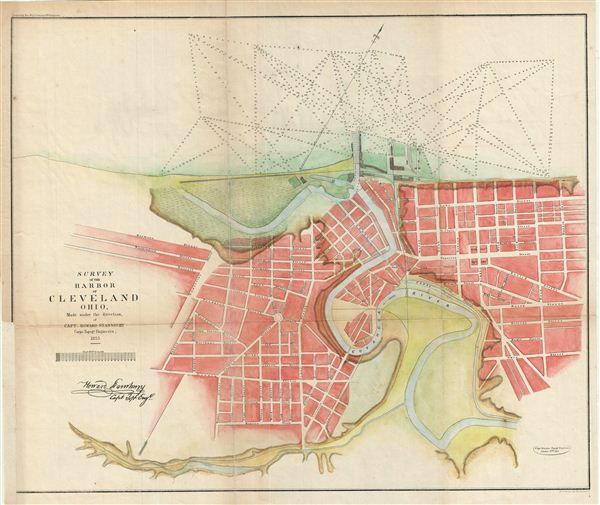 1853 Topographical Engineers Map of the Cleveland harbor, Ohio. Survey of the Harbor of Cleveland Ohio. This is an uncommon example of the Howard Stansbury's 1853 topographical survey map of the Cleveland Harbor, Ohio. The map covers the city of Cleveland from Monroe Street (Monroe Ave) to Front Street (Front Ave) and shows soundings in feet. The Army Corps of Topographical engineers engaged Stansbury to complete this survey in anticipation of improvements to Cleveland harbor. This map was created under the direction of Capt. Howard Stansbury and engraved by Ackerman in 1855.